What Happens if I Don’t Wear My Orthodontic Rubber Bands? Think you can get away with not wearing your orthodontic rubber bands? Think again! If you’re in braces, chances are you’ll be required to wear rubber bands for at least a short period during your treatment. Rubber bands apply pressure and help move your teeth into the correct position. Even though they are small, they are a powerful orthodontic tool. When it comes to rubber bands, one size does not fit all. Orthodontic rubber bands come in various sizes, strengths, and widths. If you’ve been instructed to wear them, make sure to use the specific rubber bands given to you. Substituting the correct bands with a friend’s rubber bands or rubber bands that were given to you a few months ago does more harm than good. Using the right orthodontic rubber bands is the best way to ensure success. What if I Don’t Wear Them? Simply put, your orthodontist will know if you do not wear your orthodontic rubber bands. Keep in mind that it’s not possible to wear rubber bands for just a day or two and expect positive results. The effect of wearing orthodontic rubber bands takes place gradually. Keeps your treatment on schedule. If rubber bands are part of your orthodontic treatment, it’s vital to follow our instructions. Avoiding rubber bands can extend your orthodontic treatment for a significant length of time. Rubber bands are easy to put on and take off. Even though your first attempt at putting on rubber bands might be a challenge, the process is simple. Before you know it, you’ll be able to put on and take off rubber bands without looking in a mirror. Wearing them is practically effortless! They are removable for eating and brushing. Don’t worry. You can remove your rubber bands when you eat and clean your teeth. Simply re-apply the rubber bands afterward. Not everyone must wear them full-time. Depending on your phase of treatment, you might be instructed to wear rubber bands any time you are not eating or brushing. Or, you might be asked to wear them for just a few hours a day. Have Questions About Orthodontic Rubber Bands? We welcome your questions about rubber bands! 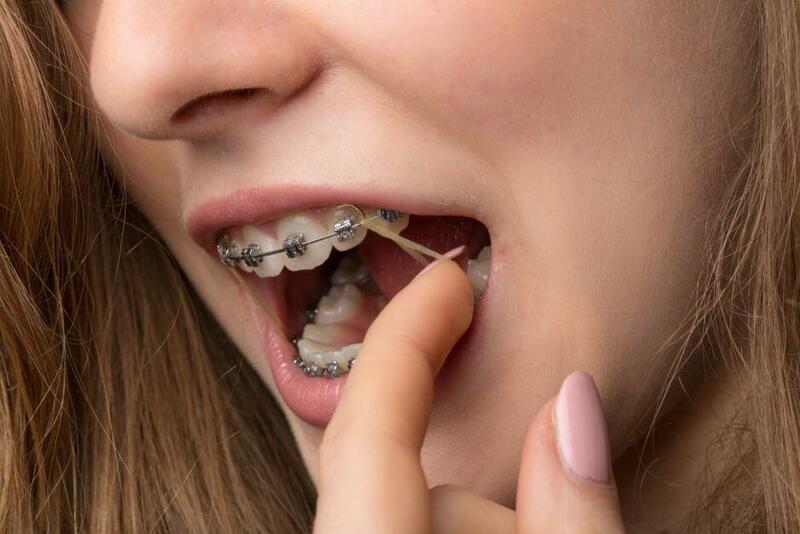 If rubber bands are part of your orthodontic treatment, we will explain how to use them when you’re here for your appointment. Please follow provided instructions and don’t stretch your rubber bands before putting them on! If you are new to rubber bands and your teeth are sore, please do not stop wearing them as prescribed. It can take a few days to get adjusted to wearing them. Just like you might feel soreness after a regular orthodontic appointment, discomfort subsides within a few days. However, if you have any concerns, please contact us. We are here to reassure you that your rubber bands are doing their job and working correctly!